News Release - Equifax Breach Begs the Question: Are Financial Service Companies in New York Safe from Cyber Attack? - CompCiti Business Solutions, Inc.
News Release – Equifax Breach Begs the Question: Are Financial Service Companies in New York Safe from Cyber Attack? NEW YORK, NY, November 15, 2017 /24-7PressRelease/ — The recent Equifax breach underscores the importance of cybersecurity for all financial services companies. In New York, the Department of Financial Services’ (DFS) new 23 NYCRR Part 500 regulation is now in effect to protect companies against such cyberattacks. Many, however, do not understand how to develop their own cybersecurity programs as described in the regulation. One misconception of the regulation is that a risk assessment alone is sufficient to accurately determine preparedness for cyberattacks. Are you in compliance? Click the image above to see our short video on what you need to know and how CompCiti can help. A shortcoming of simple risk assessments is that they do not provide a company with all the information it needs to understand the effectiveness and state of its current cybersecurity efforts. A full IT audit, on the other hand, does so. For instance, section 500.05 of the regulation calls for penetration testing and vulnerability assessments, and a full IT audit includes these. “The DFS has created an incredible document here with its new cybersecurity requirements for financial services companies. In many ways, it is a blueprint for building a solid cybersecurity program. 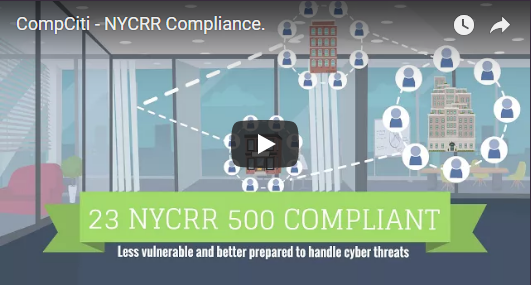 We want to help our financial services clients become compliant with 23 NYCRR Part 500 effectively and efficiently. Just as importantly, we want to ensure that their clients’ data is fully secured against cybercriminals and cyberthreats, and that it is also secured against power failures, natural disasters, and other risks,” Vohra said.